Metanor Resources Inc. (“Metanor”) (TSX VENTURE:MTO) (OTCBB:MEAOF) is pleased to announce the drilling results for the new zone on the Moroy property located 1 km from the Bachelor mill. Metanor estimates that the mineralized intercepts’ true thicknesses reach 70 to 95% of the drill cores. A capping of 31 g/t was used or 1 Au ounce. The Company uses a rigorous, industry-standard, QA/QC program. The samples were assayed by fire-assay at the Metanor assay lab. Blanks, duplicates and certified reference standards are inserted into the sample stream to monitor laboratory performance. The quality control program of the assay results (QA/QC) adopted by Metanor includes a minimum of 10% of controlled assays being conducted as well as verification by an independent ALS-certified assay laboratory in Val-d’Or, Québec. Results of the spot checks were consistent with those reported. 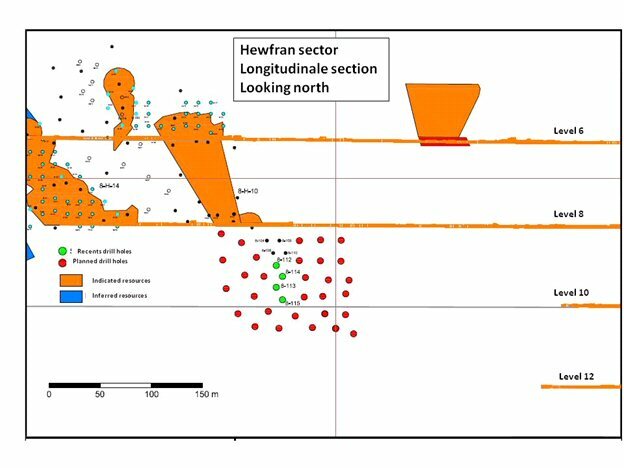 The drill located on level 6 has intersected 6.82 grams per tonne over 8.7 metres. The two drill holes intersected the veins between levels 6 and 8. The results are in the table. These new results demonstrate the existence of two distinct veins located near each other. The A zone is dipping near 55 degrees and the B zone is dipping near 90 degrees. The results continue to expand the dimension of the 8-H-14 (see the longitudinal section for the holes location). The two drills on level 6 continue their exploration activities and results will be published as they become available. On the surface, a fifth drill began its exploration activities on July 1. The goal of this surface campaign is to follow up with the geophysical work completed in the fall 2014 on properties surrounding the Bachelor camp that generated targets to drill. The first targeted area is a property east of the mine. The team at the Bachelor mine intersected 18 grams per tonne over 1.5 metres on level 12 in an unknown sector. This sector is less than 80 metres south from the current infrastructure of level 12. The results are released in the attached table. This sector was not drilled previously. Three holes are planned to be drilled in the same area to verify the continuity and orientation of the gold structure. The results will be published as they are available. Metanor Resources Inc. has provided an update of the exploration activity at its Bachelor mine. The team at Bachelor mine intersected 12.8 grams per tonne (g/t) over 10.8 metres in the area directly beside the sector already published June 22. The results are released in the associated table. Over a period of 45 days, 2,612 metres were drilled resulting into a resource calculation between level 6 and 8 by the mine technical service team using a polygonal method as displayed in the table. Samples capped at 31 g/t. Drill density: 15 m by 15 m.
The cost to drill the 2,612 metres of diamond drilling was $169,377, which corresponds to an average cost of $20.30 per ounce identified. A second drill is now active in the same area of the mine. The results will be published in the coming weeks once available. A total of 25,000 metres of drilling are planned in the same sector in the coming month.